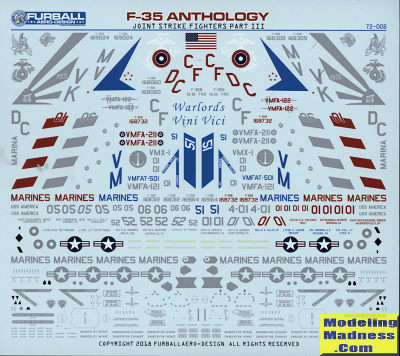 Furball Decals FD72-008: F-35 Anthology III. 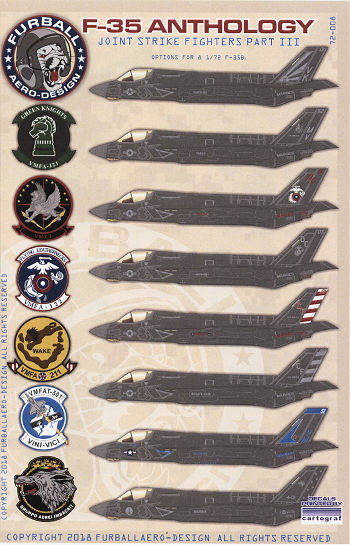 This particular sheet is quite welcome as it covers the F-35B, the type operated by the USMC and to be operated by others as more aircraft are built and come on line. On a personal note, one of the things that struck me looking through the instructions are the 169xxx burea numbers. When I entered the Navy in 1972 the latest and greatest were 158xxx and while it doesn't seem like a thousand planes is a lot, in today's environment of where one F-35B costs the same as multiple Tomcats, it is an impressive number. So all of the eight options on this sheet are painted the same color, which is FS 36170, which I don't think is yet available ready mixed. If so, let me know. You'll also need the panel tape decals either from the kit or an aftermarket source. Other than one option, all are USMC. The first is from VMFA-121 at Iwakuni in 2018. Next is a VMX-1 plane when aboard the USS America in 2016 for trials. Two VMFA-122 options are provided. The first has a colorful tail marking from 2018 while the other is from the same time period at Cherry Point. With the red and white tail stripes is the first of two planes from VMFA-211 also aboard the USS America in 2016. This is the commander's plane while a standard line bird is the second option. VMFT-501 is the training unit at Cherry Point and the option for that unit in 2018 is the commander's plane with blue markings and full color insignia. Finally, an Italian Navy plane with Gruppo Aerei Imbarcati at NAS Pax River in 2018.